Would you like to learn how human-centric photos can increase your conversion rate by 4.6% and get you more sales & opt-ins? Here you're going to see the types of images you can use to up your conversion rates and get more interest in your products. This can be applied to Facebook Ads to get more clicks (in my experience 10% more), eCommerce Product Pages for raising sales rates (~4.6%), and more. 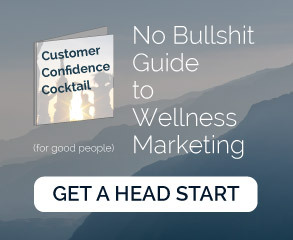 This is part of my Customer Confidence Cocktail, a list of the most effective and actionable ways to raise potential customer's trust in your company, and therefore raise your conversion rates. I recently set up ads and a product page for a tech company that originally had a click through rate of 1.2%. The images were focused on the product's features and visual appeal. They had a white background and felt like catalog photos, and I didn't blame them (or you for doing the same) because there are plenty of bad examples out there, and even more bad advice. I created some new images for their Facebook Ads that focused on PEOPLE using their products, and the CTR (click through rate) jumped to 11.6%. Next step was the eCommerce page. I put very similar photos on the product pages above the text description and buy button. Nobody could avoid seeing it. And what happened? Conversion rates jumped from 1.1% to 5.7% from adding just one image. A 4.6% sales increase from one photo. If 4.6% doesn't sound like a lot, consider a small business making $50 per product sold, and they have 1000 qualified customers visit the site in a day. Converting an extra 4.6% of them means they made an additional $230 that day on this page alone. So what do these photos look like, you ask? Human-centric? What the heck do you mean, Mike? Let me show you. (I'm not going to use the real company, they wouldn't like that) The product here is a portable power bank, a cell phone charging battery. Here is what you shouldn't use for your main advertising photo. I know, I know. "It looks nice! It shows what it does!" But what does it make you feel? Nothing. It is in an un-natural space. It's in purgatory– an all white space of nothingness. Take a look at the next (double) photo. This shows people (me on the right, in delight) using the product. It makes your audience able to picture themselves using it. That's what you want to do. This photo is in a real place. It's a recognizable situation that your customers know well. Make your viewer able to imagine themselves happily using the product– that's how you reach them. It communicates that it charges phones in both, but in the second example, it tells a bit of a story and shows the product off more. It says "I'm small enough to fit into a pocket." And "I make people smile!" No matter how hokey it can feel, it's real, and it works. Try to recreate these images with your own products or services. Focus the main product photo on people using your product, not the cool features of your products with close ups of knobs that only 20% of customers will care about. I am not saying that they aren't valuable features or photos, I'm saying that they should be the third or fourth line of offense in your web marketing army, not your first.